Dr. Paterick Stortebecker MD, PhD, a Swedish neurologist, explained a process whereby several neurological diseases could be the result of infections of dental origin. Infections of dental origin can easily form thrombosis and embolisms in the jugular vein. Then these blockages spread quickly and easily into the cranial vein and cavernous sinuses of the cranium. Bacteria in these blockages could cause various diseases by a very similar mechanism. It is worth noting that this process requires large aggressive infections like you find in acute dental abscesses, infections around wisdom teeth or very serious periodontal disease. Intracranial Abscess – This is simply an infection inside the cranium where the brain is housed. Dental infections can get into the jugular vein and spread up into the brain very quickly and easily. These are not uncommon and the fact that a dental abscess can cause such an abscess is widely accepted as fact. This is one more good reason why any dental infection should be treated quickly and aggressively. A former associate at the Foothills Hospital recently told me that during his recent tenure at this hospital that they saw at least one such abscess every month or so. Brain Cancer – Brain cancers were Dr. Stortebecker’s area of specialization. .While not all brain cancers are due to dental infections; Dr. Stortebecker witnessed far too many that were. These were often confirmed at autopsy. The mechanism is exactly the same as the mechanism by which a brain abscess forms. However, if the bacteria in the abscess happen to produce some carcinogenic waste product then a brain cancer can be the result. Epilepsy – Here again the mechanism is exactly the same as the mechanism for a brain abscess or brain cancer. In this case the abscess spreads to the back of the brain and gets established in the occipital lobe area. If some of the bacteria can produce a neurotransmitter that is capable of causing abnormal electric discharges then this in turn can spread to central regions of the brain and manifest as a grand mal seizure with generalized convulsions. However, Dr. Stortebecker cautions that while this mechanism may lead to a grand mal seizure; that many causes can lead to the same outcome. There are so many causes in fact that Dr. Stortebecker does not consider Epilepsy to be a disease per se. The other causes are head injuries, cerebro-vascular disorders, intoxications, infections, brain tumors, or metabolic disorders such as hypoglycemia or insulin shock. While this is not an accepted explanation for the cause of MS; it is scientifically sound from start to finish and is the only explanation that easily explained demyelination. 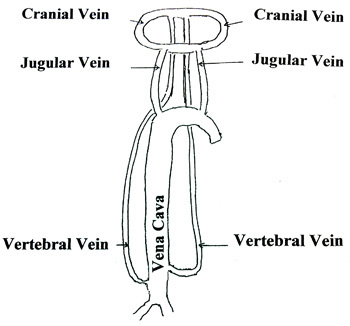 It is worth noting that the cranial vein is located very close to the brain stem and the 3rd,4th, 6th, and 8th cranial nerves. Still there are nearly a dozen other explanations for the disease that have come and gone over the years (None of which can explain demyelination.). They include: mercury poisoning, lead poisoning, cadmium deficiency, iron accumulation, hydrocephalus, hydrocephalus linked to temporal bone displacement, hydrocephalus linked to rogue macrophages, problems of fat metabolism, lack of vitamin D, lack of Omega-3 fat, congenital defect of myelin, slow virus, K-9 Distemper virus and of course auto-immune disease. 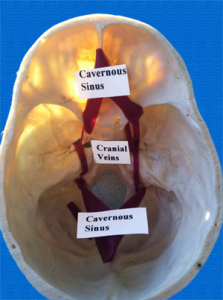 Dementia – It is also easy to understand that if a brain abscess were to become established in the anterior cavernous sinus that it would be very close to the frontal lobes of the brain. Damage in this part of the brain leads to confusion, trouble with speech, changes in behavior and personality, and eventual memory lose. Again, lots of things cause dementia. The main ones are Alzeheimer’s and diabetes but problems can also result from illicit drug use, improperly combined prescription drugs, various intoxicants, and head injuries. Alzheimer’s Disease – There are many diseases that cause dementia but Alzheimer’s is the worst of them all. The cause is unknown but inflammation is suspected to play a role. Some patients who had Alzheimer’s Disease but were on high doses of anti-inflammatory drugs such as Celebrex for other reasons did show a noticeably slower rate of progression of the disease. Some recent studies out of the University of Oregan and the University of British Columbia make a strong case for the idea that oral spirochetes may play a role in the cause of this disease. In the University of Oregan study researchers analyzed small pieces of the frontal lobes of 34 cadavers. Sixteen of these had Alzheimer’s Disease and eighteen were controls. The results were that 14 out of the 16 Alzheimer’s Disease samples had spirochetes that are normally found in the mouths of people that have periodontal problems. Only 4 of the 18 controls had spirochetes in their tissues. The significance of all of this to healthy patients today is that very good home care and regular care by skillful hygienists may prevent the spirochete infections that cause this form of dementia later in life.